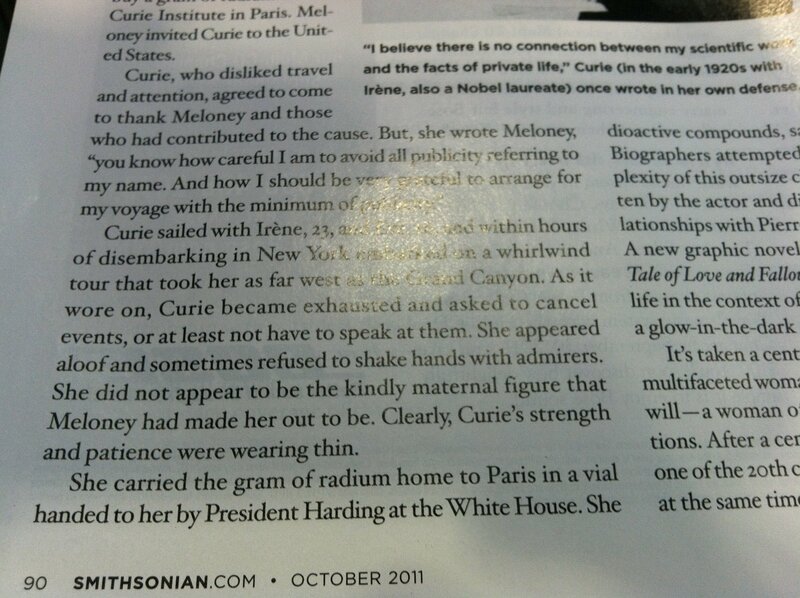 Sorry for the glare, but I was enjoying reading an article about Marie Curie in Smithsonian at the airport so I snapped a photo to remind me. She was fabulously brilliant and has changed our world, with the added challenge of doing it all in a time when women were not welcome in science. It sounded like she was most comfortable in her laboratory and had a hard time with crowds, attention, etc. My guess is that if she had been alive today she would have ended up diagnosed on the “spectrum”, high-functioning of course, but nevertheless demonstrating difficulty with social skills. I imagine many of our current scientists and a disporportionate number of those with PhDs would, in today’s diagnosis-happy climate, be diagnosed with Asperger’s… brilliant, hyper-focused, amazing people, that prefer their work and labs over social situations. One of the comments in the magazine is that Marie and her husband “renounced” pleasure for science, but I think their pleasure WAS science.